100% Polyester, exclusive of trims. Jumpsuit has velcro fastening.Tail and wings attach with velcro. Printed jumpsuit with attached shoe-covers and detachable tail, wings and mask. 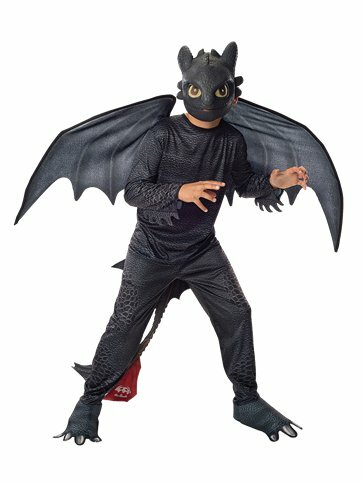 This officially four piece, Toothless Costume features a black, scale-printed jumpsuit with attached shoe-covers and a jagged tail which attaches with Velcro. Also included with this Dragon costume is a cute moulded dragon face mask with elastic strap to secure in place and a pair of matching, wire-framed wings.